With seven days to dine and $25 three-course meals, Downtown Jacksonville is one delicious scene! Check out that spot you've been meaning to try, or revisit an old favorite during the third annual Eat Up Downtown dining week. Participating restaurants – from hip cafés to elegant steak houses – each offer specially selected, three-course dinner menus for $25 per person. There are no coupons to clip or tickets to buy, simply view the menus and make reservations at the restaurant of your choice. 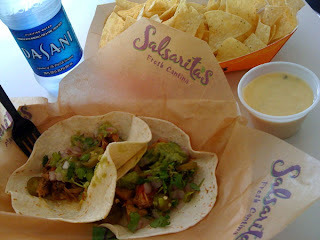 Just a quick shout out to UNF students going back to school and looking for a quick bite between classes - Check out Salsarita's for seriously good tacos - fast, fresh and delicious. They were a refreshing stop on the Taqueria Tour last week when we were on campus for a meeting. 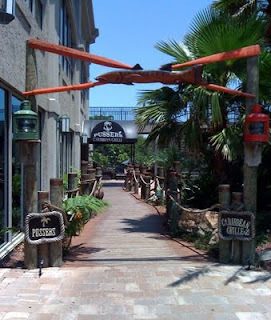 A few weeks ago we looking for someplace fun for lunch at the beach, and a thunderstorm was headed our way, so we steered back to Ponte Vedra and ventured into Pussers. That first visit got mixed reviews from us - the crabcakes were a scorched n the outside, sloppy on the inside mess - tasty but a mess nonetheless, the special corn chowder was pedestrian at best - it struck me as being straight off the Sysco truck. M's hotly anticipated mashed potatoes came out as a globe of "Sticky Rice" - a new item they were trying out - basically oversteamed rice rolled with pineapple and scooped into a ball with an icecream scoop. By the time they could rectify the mistake she had eaten her entree - which would have been stone cold if she hadn't. Here's the upside - the drinks were heavenly. Transformative. A little sip of Caribbean sunshine on a stormy day. The service was friendly and accommodating, and the atmosphere was relaxing, so we stayed and sipped a few more glasses of sunshine before taking our leave. My next visit was taco time. The fish tacos there have been talked up by a number of friends, so I was happy to add them to the Taqueria Tour experience. First up was the Lava Flow - a frozen coconut concoction with rum and a strawberry slide that created the aforementioned effect. The effect on me was calming and satisfying. Tacos arrived VERY quickly, and they looked pretty good. 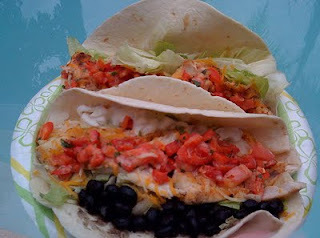 Two large portions of fresh (so they said) Mahi, nestled in lettuce leaves and tucked inside a tortilla, with melting cheese, salsa, guacamole and sour cream on the side. AND there was the sticky rice mess. Just odd, that one. 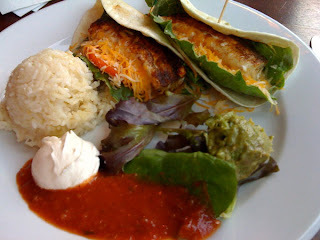 I really wanted to like the fish tacos - they looked so good. One bite, though, and I could tell the fish was just not quite fresh. Not bad, just not good. You know that slightly tinny, mineral taste fish gets when its getting ready to turn? Well these tacos had that in spades. I took four or five bites, then just moved them around on the plate for awhile. I ate the cheese and the toppings without the fish, and called it a day. Fiesta Central at Jacksonville Beach! 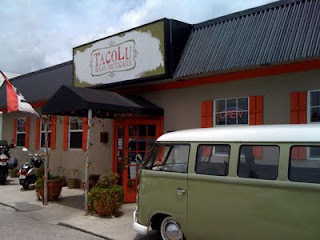 Baja Style tacos are the thing at TacoLu in Jax Beach, and of those I'm partial to the spicy Chingona Chicken and melt-in-your mouth Beef Brisket. Homemade tortillas and spot-on seasonings make these little gems a thing of beauty. I've loved everything I've tried here EXCEPT - Bangin' Shrimp Tacos - might be somebody's thing but they were too sweet for me - almost like candied shrimp. I wish they had an alternate shrimp taco on the menu, but no big, they have so many others to choose from. They rock out some awesome specialty tacos, too. My personal favorite is Grilled Lamb with feta and mint - a handful of heaven on a homemade corn tortilla. Another sure winner is the Taco Rosa - Seared Ahi Tuna with cucumber-avocado-tomato salsa. Vegetarians - they've got you covered too - with the Veggie and the Avocado tacos. Wow - what a great little place! People kept telling me about this new taco place on Atlantic Beach, but nobody could remember its name or what it was called. I found a couple of interesting new places while I was searching, but not the taco nirvana everyone and their aunt Fannie was now raving about. Then last weekend I was house and pet sitting for some friends in Atlantic Beach, and while looking for a spoon for my yogurt I found a menu for this place called Atomic Flying Fish Seafood... Voila - there were those awesome tacos! Armed with the name, address and the Prius' GPS I finally found it - tucked in next to a convenience store across from Al's Pizza. 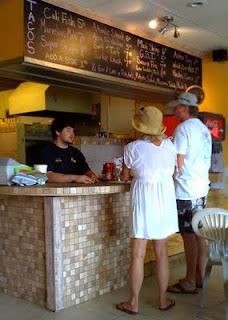 Owner Buckley is friendly and earnest, and the place is clean with beach-casual decor. He tells me he first opened as a seafoo d shop, but the tacos were so popular he ditched the retail fish operation and focused on developing the taco stand side of things. Fish tacos are especially good here. Grilled Grouper and Mahi were both great. The fish is fresh and well seasoned, perfectly prepared. Prices are a little higher than some spots, but you get a good portion, with lots of extras - red peppers were crisp and sweet, black beans and crema rounded out the Mahi special. I was anxious to get back to little Grommit the beagle, so I took mine to go and enjoyed them poolside. There is a small seating area though. If you go, tell Buckley that crazy chick from Nourish The Beast says hey. 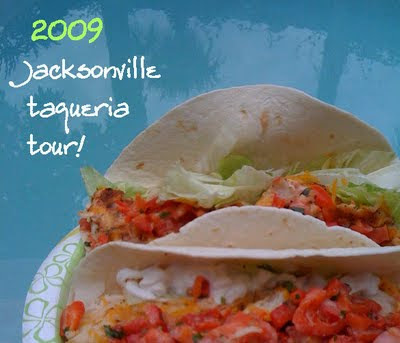 I'll be back, but probably not before I finish the 2009 Jacksonville Taqueria Tour! What could be better on a sunny afternoon than a trip to Tacoville? 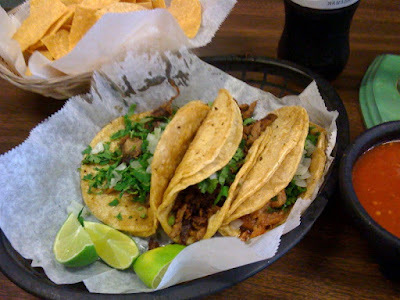 A few months ago, inspired by (and somewhat envious of) a blog about Taco Trucks in Columbus, Ohio and this article by Coulter Kirkpatrick about our very own taco truck I announced I was launching the 2009 Jacksonville Taqueria Tour. Since then I've been hunting, nibbling, and wolfing down some of the best (and... not so best) tacos in Jax. 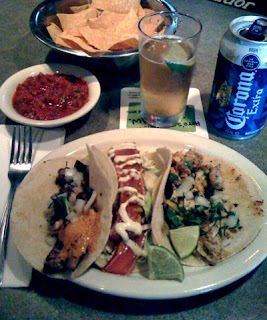 Along the way I discovered some new places, some old prejudices, and some excellent tacos. There are more to come, but I wanted to share these few with you before the memories fade. Next stop is one of my favorite restaurants on Jacksonville's west side. 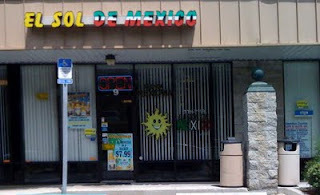 El Sol De Mexico is in a strip mall on Lane Avenue, south of Normandy. There is a small market next door where fresh tortillas are sold, along with canned goods and tamales. I visited during the crowded lunch service. The patrons (mostly men) were enjoying their noon meal with friends and co-workers, and when I walked in and sat down their lively conversation stopped entirely. I mean, you could hear a pin drop. They weren't staring at me, just silently slurping their soups and finishing their platas. It took at least ten minutes for any conversation to continue. Ironically, they all spoke Spanish, which I don't... The waitress brought a plastic covered menu of tex-mex style combo platters. I pointed to the daily specials written on the wall and ordered from there. 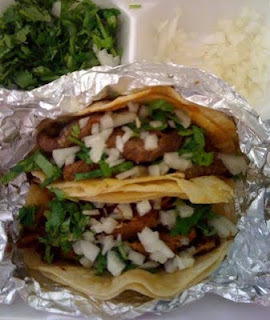 The next visit I came after the lunch rush and ordered three tacos - Barbacoa, Pastor, Lengua. They were all good and impossibly fresh, but Carnitas was amazing - soft, silky, perfectly seasoned melt in your mouth porky goodness. This was one of the best tacos I've ever had. Ever. The staff is always pleasant, and the place is much like a typical mom-n -pop grocery / restaurant, with the owner's son playing in the store next door, and loud festive music blaring from the stereo. One thing I've learned from this experience - it is true that some restaurants have one menu for guests, another for their amigos. 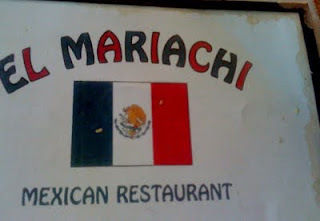 An impulsive drop in visit at El Mariachi on Blanding Blvd. resulted in some pretty good tacos, but not before being handed this nasty stained menu, with bits of crusted food still clinging to it. A quick glance yielded the ubiquitous combos uno, dos, tres, etc. that are the hallmark of most bland Americanized Mexican restaurants. I was sure there was something better lurking behind that kitchen wall, so I quizzed the waiter - "I'd like a plate with just three tacos - what kinds of taco do you make" "We have the beef, and we have the chicken." OK, is that all?" Yes. "What kind of beef?" That one stumped him, so I persisted. "What do you put on the tacos?" "We put the lettuce, the cheese, the tomato... and the beef or the chicken." No cilantro? Onion?" "Onion, yes, we can put that. What kind of tortilla do you want - soft or crunchy?" Now I know this guy is messing with me... "Can you do the corn tortilla but soft?" "No, the corn... is crunchy. Flour is soft." Now I get the picture that there is nothing of interest in that kitchen, but I can hardly walk out after the quiz session, so I order two crunchy, one each beef and chicken. They arrive almost instantly. Crunchy doesn't begin to cover it. Stale, crack a tooth crunchy, more like it. Flavorless ground beef, fairly decent chicken, both smothered in lettuce and white cheese. I politely soldier through as I take a deeper look at the menu - crusted on germs and all. Only then do I spy the small section tucked away to one side, written in Spanish, titled "Por Our Amigos." For our friends! The mainstay of the Amigos menu is, in fact, a plate of three tacos, with your choice of Pastor, Lengua, Chorizo, Barbacoa, Asada and more. NOW we've got ourselves a ball game. I call my friendly waiter over, and in as sweet a tone as I can muster, with the stale crunchy tacos still largely intact, I ask him "What's this? You keep the good stuff for your friends? I'm your customer too... Why didn't you tell me about these when I asked about the tacos?" His sheepish grin gave him away. "Is it because I'm white?" "Yes, well m ost white people, they only like the beef and chicken, they don't like this." Well I do. They were out of a few items so I got one asada, one barbacoa - to go. 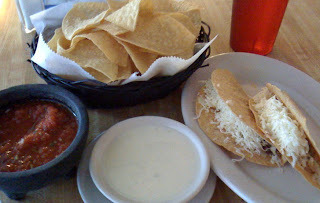 They were heaping portions of well prepared and seasoned meat, served on steamed, (non-crunchy) corn tortillas. 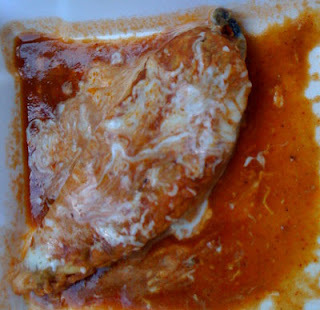 I also ordered a poblano chile relleno, which was delicious, but not as good as grandma used to make. 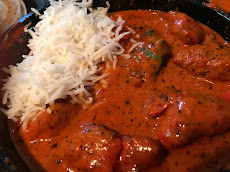 Prices were decent, food was good, the service was pleasant - despite the racial profiling.